Other than the normal awareness we all have for ourselves, mood rings are a resource for the spiritually related individual. Mood rings were invented in 1975 by a jewelry designer and a physician, and they sold $1 million worth of them in a three month period. Of course, there is no trick, and it’s not based upon your emotions; it’s based upon your temperature. 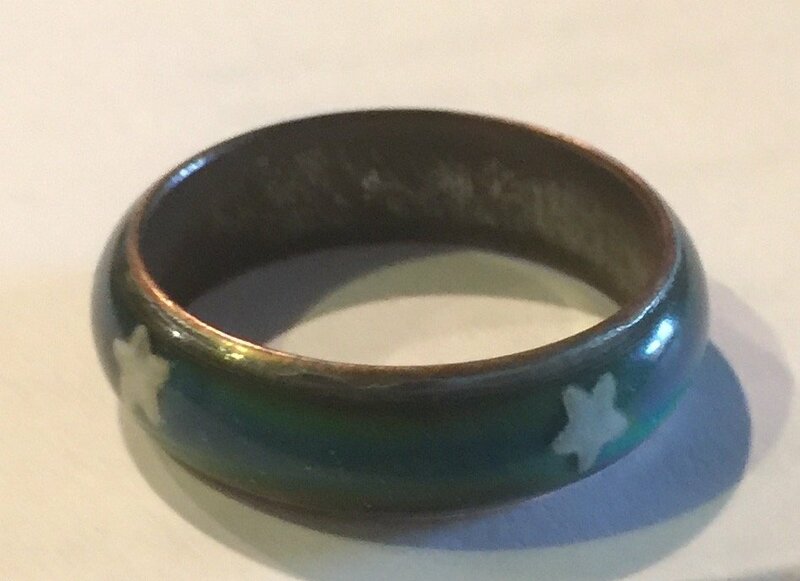 My mood ring is normally green, which represents harmony and stability. Mine also has 4 tiny stars on it that glow in the dark- it’s actually pretty cool. A friend bought them for each of us while on a trip to Jackpot, NV – including my Mom. They wear theirs all the time and I sometimes feel guilty when I don’t have it on around them. Silly, I know. RED – 1: A hot night filled with passion after a romantic evening with fine food an cuisine. Hearts racing with anticipation of a sensual kiss. RED – 2: The exhilaration of downhill skiing with the powdered snow whispering with every turn. Adrenalin surging through each muscle and organ… excitement explodes! ORANGE – 1: Grandmother welcomes you into her home and offers you a plate of fresh-baked chocolate chip cookies. Her house is warm and inviting and vibrant. ORANGE – 2: A fuzzy welcome mat on the patio with 10 puppies bouncing at your feet yearning for attention. YELLOW – 2: Dorothy from the Wizard of Oz skipping down the yellow-brick-road. GREEN – 1: A walk in the forest with pine trees and green, lush foliage surrounding a small green meadow with daisy’s, daffodils and lilies. GREEN -2: Piles of cash stacked up in your 200 foot yacht while you cruise around the world. BLUE – 1: The waves of the ocean crashing gently as your toes sink into the white sand. It’s quiet and peaceful with only the songs of sweet birds playing a gentle melody. BLUE – 2: Soaking in a hot tub, drinking beer and eating potato chips while watching TV. WHITE – 1: All creatures great and small when they can exhibit unconditional love. BROWN -1: A Golden Retriever greeting you at the door. Better yet, a room full of Golden Retrievers. BROWN – 2: After the first date and the other person says “I just want to be friends”.